The Foundation (2301 Main, Vancouver, BC, Canada, phone: 604-708-0881) is a funky vegetarian restaurant with retro decor and a liberal, activist vibe. Popular dishes include the nachos, salads, and pasta. 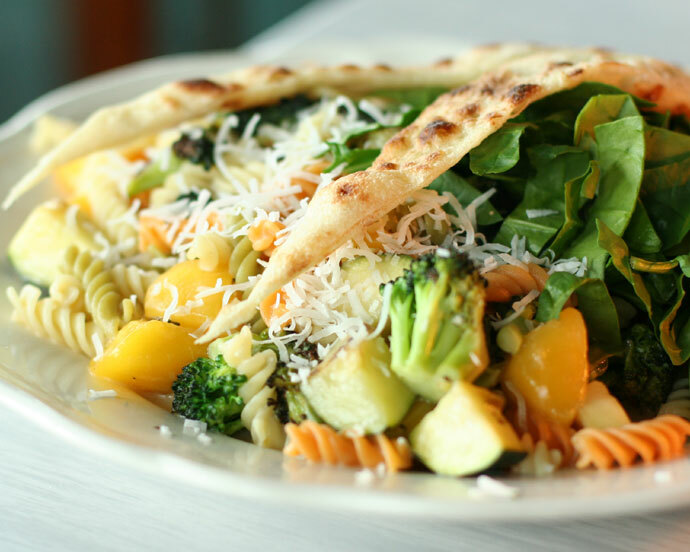 Pictured below is my Mango Forte pasta ($9.75) which was an inventive dish that combined rotini pasta with a sweet dressing, fresh stir-fried vegetables, mango, and spinach salad, sprinkled with fresh Parmesan cheese. It’s not really a place to bring a date (unless your date is an outdoorsy vegan hippy/ skateboarder musician type) and I probably wouldn’t go here for business dinners. But it’s great for friends/ boyfriends/ girlfriends, no matter who you are. The food is definitely comfort food. The rice/ quinoa dishes are rich and saucy with nuts and raisins and things in them. They kind of remind me of stuff my vegetarian hippy mom would make me (if I had one). The salads are tasty. My favourite dish by far is the nachos. For just $8 you get a platter of nachos with corn and beans, and amazing salsa/sour cream, that can fill two people. At night it’s a great place to come for candlelight & wine. They’re open late, too. Sun-Thurs till 1am and Fri/Sat till 2am (but they stop serving drinks at 1am). 15,699 views. This entry was posted on Tuesday, April 8th, 2008 at 9:31 pm	and is filed under Affordable, Budget, Burgers, Casual, Comfort food, Creative Dishes, East Vancouver, Food Photos, Fun atmosphere, Funky, Healthy Food, Hip, Home Cooked Style, Lunch, Main Street, Nachos, Open Late, Pasta, Reasonably Priced, Restaurant, Students, Vancouver, Vancouver Restaurants, Vegan, Vegetarian, Very low prices. You can follow any responses to this entry through the RSS 2.0 feed. You can skip to the end and leave a response. Pinging is currently not allowed. hi there,I have been to this place the 2nd time,I like the food what I ordered,but the service is slow,you need more servers available at least 3-4 servers on the floor. Anyway, I am coming back again, I hope you understand when it gets busy,customers come in and hungry.